The Eastern States Archaeological Federation (ESAF) will hold its annual meeting at the Holiday Inn in Johnstown, Pennsylvania on November 5-7. The Society for Pennsylvania Archaeology will host this highly educational event that is open to the public. There will be over 40 presentations focusing on rockshelter archaeology, the Transitional Period, Monongahela archaeology and the analysis of soils in archaeology. The guest speaker on Saturday evening will be Dr. Dennis Stanford of the Smithsonian Institute. The title of his presentation is “Seeking a New Paleolithic Paradigm”. He will discuss several recent discoveries in the Middle Atlantic region that suggest the ancestors of Native Americans migrated to the New World at a much earlier date than previously thought. The Eastern States Archaeological Federation is an organization of state archaeological societies representing much of the Eastern United States and Canada. ESAF was organized in 1933-34 to provide a forum for the exchange of archaeological information among archaeologists and state archaeological societies. With a membership of 12 state societies and over 300 individual memberships, ESAF continues to foster international cooperation and information exchange within the archaeological community, as well as supporting public outreach, education, and participation. a. To serve as a bond between the Member Societies. b. To encourage and promote scientific archaeological work by the Member Societies, Individual Members and Institutional Members. c. To publish and encourage the publication of reports and articles about the archaeology of the region; anthropological studies related to the archaeology of the area; and contributions from inter-disciplinary fields related to the study of Eastern North American archaeology. d. To promote the spread of archaeological knowledge. e. To engage in the archaeological projects which exceed the capabilities of the Member Societies. 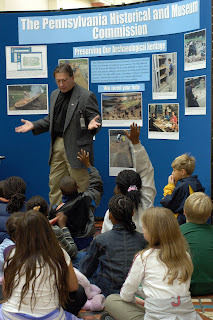 On October 26, 2009, from 10:00 until 2:00, archaeologists from around the Commonwealth will gather in the East Rotunda of the Capitol to celebrate Archaeology Month. This event will be sponsored by the Pennsylvania Archaeological Council (PAC), the Society for Pennsylvania Archaeology, Inc (SPA), the Pennsylvania Department of Transportation and the Pennsylvania Historical and Museum Commission (PHMC). These organizations will provide a variety of exhibits on Pennsylvania archaeology. The theme is “Save the Past for the Future”. The goal is to focus the public’s attention on the significance of archaeological resources in the Commonwealth and to advocate for their preservation so that they may be appreciated and enjoyed by future generations. We might add that this information can also be used to improve our own future. At noon, there will be a ceremony for the John Stuchell Fisher Award. This is given in recognition to local, state and national officials who contribute to the promotion and understanding of archaeology in Pennsylvania. This year’s recipient is Mark Platts, President of the Susquehanna Gateway Heritage Area. He is receiving this award for efforts in preserving archaeological resources in Lancaster and York counties. Of special significance is his successful initiative to preserve the last two villages occupied by the Susquehannock tribe in the 17th century prior to their demise in the region. Steve Warfel, former Senior Curator of Archaeology at The State Museum of Pennsylvania will comment on the significance of this work. The speakers will begin at 12:00. Archaeologists from the Section of Archaeology of The State Museum and the Bureau for Historic Preservation will represent the Pennsylvania Historical and Museum Commission. The Section of Archaeology serves as the primary repository for archaeological collections and holds over four million archaeological specimens in trust for the citizens of Pennsylvania. They are also responsible for the Hall of Anthropology and Archaeology in the State Museum which provides a comprehensive tour of Pennsylvania archaeology from the Paleoindian period through the 19th century. On display at the Capitol will be a spectacular array of artifacts from sites in York County reflecting the Susquehannocks involvement in European trade. Of particular interest to the younger generation, the Pennsylvania Archaeological Council and Indiana University of Pennsylvania will put on a demonstration in the early afternoon on Native American technology. For nearly 14,000 years, people lived in Pennsylvania without factories, automobiles or convenience stores. They used a relatively simple technological system to get their food, to make their clothing and obtain all of their material needs. Tying and attaching things with string and rope was a very common activity and essential to their lives. Everything from bow strings to fishing nets was necessary but where did they get the yards and yards of cordage to make these items? Cordage in Native American cultures was like duck tape is to our culture. 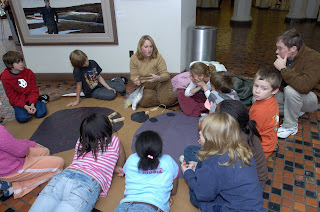 The children visiting the exhibit will be invited to try their hands at making cordage and using a prehistoric drill. Think of all of the holes that need to be drilled into items to make them functional. This event will begin at 12:30. The Pennsylvania Department of Transportation also has an active archaeology program. As part of their environmental stewardship program, they endeavor to protect archaeological sites that may be affected by their construction projects. For decades they have been conducting archaeological investigations prior to construction and they have recovered significant information on past cultures in Pennsylvania. They have developed a publication series and examples will be available, including their most recent publication on the archaeology conducted along the route 11/15 corridor. The Society for Pennsylvania Archaeology will have an exhibit describing the variety of activities they conduct around the Commonwealth to enhance and protect archaeological sites and artifacts. The local chapter, Conejohela Chapter 28, will have an exhibit presenting their involvement in preserving the Susquehannock sites in the lower Susquehanna Valley. Artifact collections were transferred this summer to The State Museum, Section of Archaeology from several of the Pennsylvania Historical and Museum Commission (PHMC) State Historic Sites. We’ve chosen to highlight objects from the Brandywine Battlefield collection in this week’s blog to spread the word that severe cuts to the Commission’s budget has led to the loss of staff, suspension of programs, and closure or transfer of visitor centers on the Pennsylvania Trails of History. The PHMC has temporarily suspended outreach and closed public venues at four of the twenty-three State Historic Sites as of August 14th, 2009. These include the Conrad Weiser homestead exhibit buildings, all visitations at the Joseph Priestley House, The Fort Pitt Museum, and the Brandywine Battlefield Historic Park exhibit buildings. Negotiations are in process for non-profit organizations to take over visitation and public outreach programs. In the meantime, local heritage societies have ramped up fund-raising efforts to meet budgetary shortfalls at all twenty-three State Historic Sites. Please write your legislatures, join the ranks of your local heritage society, and donate to save-our-history fund-raisers. To find information about volunteering and making donations for State Historic Sites click this link to the PHMC Trails of History and explore Pennsylvania’s rich and varied past. At the PHMC Farm Show exhibit, January 2010, we will celebrate the unique role archaeology has played in understanding and interpreting State Historic Sites. For those of you who follow our blog and would like to view the PHMC newsletter, click here. As this year’s excavation draws to a close, Fort Hunter retains its secrets and many questions remain unanswered. Addmittedly, this year has been frustrating. As in years past, fort period artifacts were recovered but no structural evidence was found that can be definitively attributed to the fort. Our excavations in the main block revealed that the ice house foundation cuts into the well feature, suggesting an earlier date of construction, however the exact dates of these structures continue to be unknown. The prehistoric levels produced material in the form of a relatively dense FCR (fire cracked rock) cluster along with several dozen ceramic sherds. After washing and cataloging the collection in the lab, refits of both the ceramics and FCR seem to be likely. We are hoping to be able to reconstruct a portion of a large Middle Woodland pot. In the exploratory trench in the front yard, a section of thickened A horizon was encountered. Probing north and south of the trench indicated the unidentified feature was approximately 15 feet wide and had an average depth of 15 to 28 inches. Artifacts contained within were a hodgepodge including ferrous metal objects, a glass wine bottle fragment and a Lamoka projectile point. This feature still holds the possibility of relating to the fort occupation. Next year should see the in depth investigation of the well structure at the center of our main excavation block and continued exploratory trenching elsewhere on the property in search of the stockade. While not all of our research goals were met this season, it remains a success in large part due to the time and effort of all our volunteers, and to the thousands visitors and hundreds students that participated the public archaeology program at Fort Hunter Park as part of the celebration of Archaeology Month in Pennsylvania. With the second to last week of excavations completed, the French and Indian War period Fort Hunter is proving to be elusive as ever. The feature initially interpreted to be the builder’s trench for the ice house did not pan out as the excavation in that square deepened. A similar anomaly on the north wall of the ice house was unearthed, only to contain whole, terra cotta flower pots. It seems our builder’s trench in reality was nothing more than an ornamental flower bed. Never the less, in the adjacent unit to the north of where the 1724 half penny was found, and at a similar depth, a small French flint, probably for a pistol, was recovered. Another historic feature defying interpretation is a shaft feature to the immediate west of the well structure. One of the volunteers at the site, Jerry, has been tirelessly and skillfully excavating this feature to a depth of over four and a half feet. Completion of this task would not have been possible without his help. 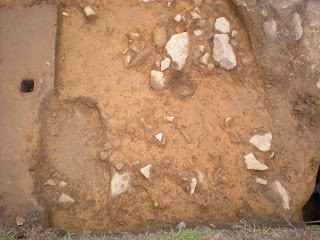 Sediment layers surrounding the well structure in the main excavation block continue to produce prehistoric features and artifacts, slowing any progress that could be made on the well itself. A few post molds, chipping debris of a variety of lithic types and even a projectile point or two have been found, but the surprising discovery is the amount of prehistoric pottery, preliminarily identified as Middle Woodland in origin. Although the prehistoric occupation is not the focus of our efforts, careful excavation and documentation is necessary to recover the complete picture of the historic resources at Fort Hunter Park. 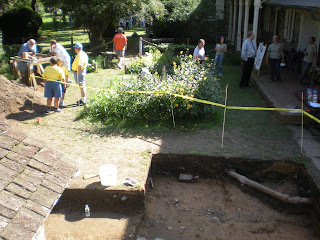 An exploratory trench was dug in the front yard of the mansion with the help of a class of forensic science students led by Ms. Mary Pat Evans of Susquehanna High School. Searching for structural evidence of the fort, they learned the field techniques of excavation and screening for artifacts in an archaeological setting. Thanks go to Mary Pat and her students for the hard work and a job well done. Sunday October 4th marks Indian Festival Day at Fort Hunter Park, and among the many activities and exhibits, archaeologists will be on hand to answer questions about the ongoing excavation. The dig site is open to the public, Monday through Friday 9 AM to 4 PM, and volunteer sheets are available for those wishing to assist us in our search for the fort at Fort Hunter Park.